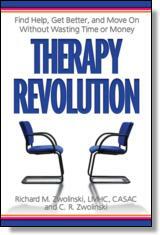 At first glance, one might think that Therapy Revolution: Find Help, Get Better, and Move On without Wasting Time or Money is slamming the psychotherapy field. However, upon closer inspection of his book, Therapy Revolution, you will learn that Zwolinski, a nationally and internationally licensed psychotherapist and addiction specialist, is suggesting that, as with any field, there are legitimate, competent players who follow best practices for therapists, as well as unethical persons who prey on persons who already are struggling with emotional issues. In his book, the author encourages clients to empower themselves, by learning how to find help, get better and move on with their lives without getting caught up in “therapy addiction.” According to Zwolinski, many clients are trapped in bad therapeutic situations that not only aren’t helping them get better, but may actually be doing them more damage both emotionally and financially. 1. The therapist must be a motivated, experienced professional. 2. The therapist must use evidence-based treatments; that is, proven methods and techniques. 3. Therapy must be carried out in a reasonable treatment time frame. 4. The therapist’s hourly fee and the entire cost of the course of treatment must be fair and reasonable. 5. The patient must be a motivated patient. In the interest of ensuring the client has control over his or her own therapeutic experience, the author has included several checklists throughout the book that can be used by the client in all stages of the therapeutic process – from selecting a therapist to determining when it is a time to move on. The author also includes a number of case studies that assist the client in recognizing what is considered good and acceptable therapeutic treatment, and identifying “red flag” situations where violations and ethical breaches have occurred. Another “red flag” situation is when the therapist begins to blur the boundaries of what is considered an ethical client/therapist relationships. Richard M. Zwolinski, LMHC, is a nationally and internationally licensed psychotherapist and addiction specialist, who has been practicing therapy for more than twenty years. He is a New York State-licensed mental health counselor.